[by Yoonjung Yi] Next episode of JTBC’s drama ‘D-Day’ is expected to draw tears out of the viewers. JTBC released still cuts of Jung Ddol-mi (Jung So-min) bursting into tears in the arms of Kim Hyun-sook (Kim Jae-hwa), which is to raise curiosity amongst the mass public. In the drama, Jung Ddol-mi’s father came to Seoul in order to be with his daughter, and he had an accident while helping out a restoration scene. 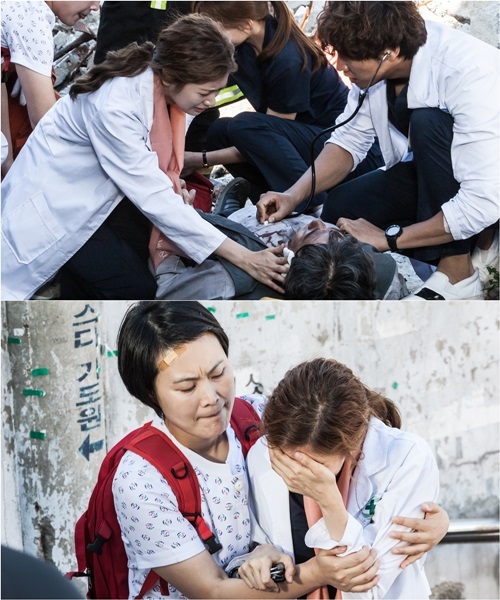 Lee Hye-sung (Kim Young-kwang) and Park Jina (Yoon Joo-hee) checked on Ddol-mi’s father, who was covered in blood. ‘D-Day’ narrates the struggle of paramedics and firefighters during realistic emergency situations in Seoul. The drama is led by Kim Young-kwang, Jung So-min, Ha Seok-jin and Kim Hye-eun as paramedics, and Kim Sang-ho, Kim Ki-mu and Lee Woo-sung as firefighters. ▶ Lee Jin Wook Gets Crazy About Fishing?! Previous articleLee Jin Wook Gets Crazy About Fishing? !